I'm running a little behing schedule. I tend to feel or rather be lazy during the weekend and my work list builds till I decide I need to step it up. So, there's a lot of new things coming up on this space very soon, couple of cool interviews and a PM tool review- as seen by the newbie! Have you thought over how creative people perform, their motivations and their unique psycholgy behind their actions? If you are creative or handle a team of creative people, this is the best collection of chapters I have read. It wonderfully engulfs you in the fascinating world of creatives, is filled with facts, research and thought provoking content. I enjoyed reading it so much over the weekend, that I downloaded the rest of the free e-books. While I try to re-write my plans for the day, now that I have more to finish and do- I found this site by Mark McGuinness very useful and inspirational. You can also learn about the daily routines of the famous and see which one works for you. 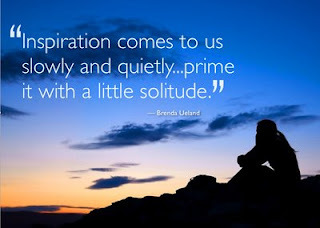 With all the inspiration at work, I'm hoping to get through my PM certifications, learn Spanish, exercise regularly and of course create better posts for the blog along with my full time job. So, enjoy the free e-books while I try to find my rightly packed daily schedule. I met Karen Macdonald at the BPUG seminar and while talking with her over lunch I asked if she would interview for my blog. I'm excited that she agreed to do it and here's the what she thought about the seminar. Stepping in2 pm: What did you think of the BPUG seminar? 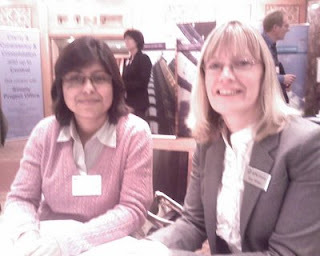 KMD: The seminar was useful to keep up to date on the various APM Group methods, meet the people behind the methods and assess what other PM professionals wanted to keep abreast of. Stepping in2 pm: Who topped your list among the speakers and why? KMD:My favourite speaker was Don Mason from Emirates Airlines because he had applied a structured method on a large and critical programme, in a difficult working environment with many cultural differences and sensitivities to cope with. Stepping in2 pm: Your suggestion to new project managers on "how networking can help" and what they should do to network? KMD: Networking is an underused tool to learn effective hints, tips and strategies from others. Project Management in my opinion is an art. The application of methods such as Prince2, MSP, MoR attempts to put some science into it, but there are so many varying dynamics in any project, no size fits all. That of course, is what makes Project Management interesting and challenging. Stepping in2 pm: Thank you Karen. Karen has 20 years varied business experience with around 10 years in Project and Programme Management. She is a Prince2 Practitioner, PMP (from PMI) and MSP and currently is the Project Services Director at Better Gameplan Consultancy in London, Uk. If you already work or are planning to work in Europe, you might want to check out what PRINCE2 is all about. Do you really think it's necessary to actually be PRINCE 2 certified? The APM Group, is the body responsible for accrediting training organisations and administering the PRINCE2 examination scheme. Like PMI, PRINCE 2 also has their new version lined up for 2009. However, they have been advising candidates that the differences between 2005 and 2009 will not be major ones. So, now that you know- relax and prepare for your exams. If you have recently taken your exams, be ensured that the your accredition will stay valid, unless otherwise notified. The 2009 version will only be implemented only after the manual has been published. The PRINCE2:2009 examinations at foundation and practitioner level will be available in all the languages as it was with the PRINCE2:2005. They are Chinese – Mandarin, Danish, Dutch, English, French, German, Italian, Polish, Spanish – Castilian. Here's the special offer for the Vday- you can actually get a £50.00 off training on any Prince 2 courses that you take up at the-PSO. Here's what you have to do, so pay some attention now. Email to julia.carton @the-pso.com with the subject line as "Voucher Id- PSO 1189/03- stepping into project management". Please mention your full name, email address and contact number. Only 1 winner gets the discount. So, if you are interested for you or your loved ones please email within March 15. The lucky winner will be announced here. The voucher is valid till 12 June, 2009. 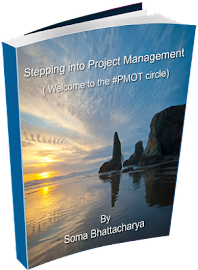 So, now that the blog is going places, it's time to let you know more about Project Management groups and accreditions. Ofcourse after we have gone through some details of the 2 day's of seminar. Among all the sessions I have heard in the seminar, they are a few which seemed very interesting. The information and the content were great however a few speakers had a charm of their own. Humor sure helps, to lighten up the subject and keep the listeners entertained. The list of speakers can be found here. Oliver Buhr, the Danish Project Manager working in Germany was full of humor. The audience enjoyed the occasional laughs as they did the subject. Alan Harpham of the APM Group was remarkable in his wit. 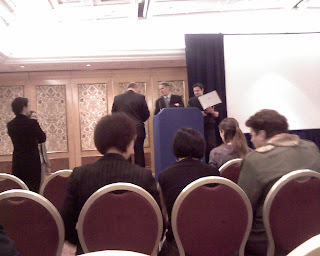 Alan made sure every speaker in the seminar was at ease while he chaired the sessions. One of the session that I think everyone enjoyed was Plenary workshop: Discovering your mental cribsheet. It was simple, easy to follow and one of the most interactive sessions of the seminar. While the audience was left scribbling and talking among each other - it was everyone's involvement in the room that grabbed the attention. It turned out to be a great topic to network over at lunch. It began with an exercise of how you come back from a leave and suddenly realise that one of the project managers is sick and you are taking over the project. 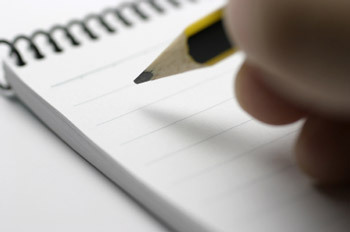 So, you can write down the 5 questions which come to your mind and share it with the person sitting next to you. I actually took my original scribbling from the session and re-did it in "paint" so I can put it up here (see picture). Other sessions I have to talk about includes Keynote address: the 40 minute business bootcamp by Colonel Bob Stewart DSO. A natural speaker, he taught about the necessity of careful planning, risk assesment and what leaders should be. Elizabeth Harrin, the youngest speaker talked about the emerging world of web 2.0. I think the trends of web 2.0 startled a lot of the audience and how they needed to keep up with the younger generation. It was a fresh approach with most wondering what "twitter" actually perhaps did. Funny I thought, it's time our generation brought something unique to the table. Watch this space, more on Prince 2 exams and a discount voucher worth 50 pounds from the- PSO coming up. The idea of going to a seminar on this scale for the first time is quite scary really but it seemed alright. Thanks to Kate (PR manager for the event) and the APM group, it all seemed very easy. Your updated business card, so you are not trying to get one printed within 2 days of notice. The right dress to be worn at the seminar (keeping in mind your changing waist line perhaps). Make sure to check out the location before and be there on time. The rest is really easy, you just go with the flow of the sessions and the people. However, a new country can be challenging in a lot of way. For me, being in a room full of people almost twice my height was really challenging. My height is not one of best assests. Conversing with senior project, programme, portfolio managers and authors/experts/trainers could be really hard, specially when you are just starting out. It's such a thrill to just share the space with all of them and frankly most are really nice people only if you can master the guts to say, hello. The most surprising part was meeting people right there who actually read my blog. Now, that was huge and inspiring. More on the seminar coming up soon. Finally I get to meet Elizabeth Harrin today at the BPUG International Congress. It was wonderful and overwhelming (as you may figure out from my clumsy expression in the picture). Elizabeth's talk on how web 2. 0 tools can be integrated with Project Mangement was fascinating and to find her so down to earth was the best part ever. More on the 2 day's seminar coming up soon. If you have been thinking of taking the CAPM(certified associate of project management) exam or trying to get into the profession, here are some links that might help you take the initiative and make it hassle free. You can download the CAPM handbook here and to know how it helps you in the current job market, read this. 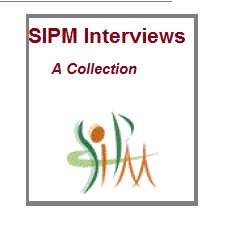 To know more about the certification, you can always refer to the PMI site. I'm in London and it's lovely. Yesterday was spent in the Thames river cruise, in Oxford street and dinner at an Lebanese restaurant. It's fairly easier to go around the city if you have a map in hand and have an idea about the public transport. 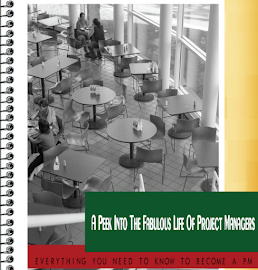 Meanwhile you can listen to these videos about project management and see what you think. I have my tickets for London and I leave tonight. The flight's really early which means I will need to be in the airport around mid -night. I still need to pack and my apartment right now looks like a complete mess. I need to be in office within the next couple of hours, which means I have to rush. If you missed out the story about why I'm off to London, click here. So, stay tuned for more updates right here.